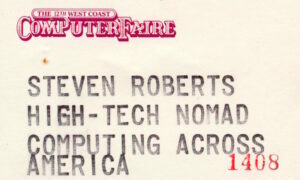 Photo: The Computing Across America crew at the GEnie booth, 1987 West Coast Computer Faire. 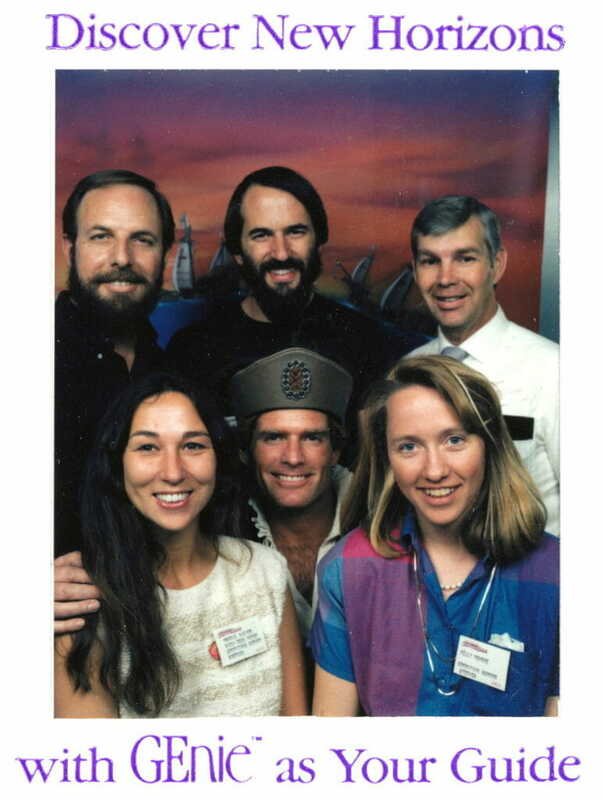 From upper left: Tom Hoobyar, Steven K. Roberts, Ray Rolls, Maggie Victor, GEnie booth personality, Kelly Monroe. Ah, Stanford in the Spring. LCD characters wafting through a beery haze, articulate guitar riffs penetrating my head with exquisite pain, flawless legs in the early stages of seasonal tan splayed everywhere in sweet abundance. The first belly buttons of spring—and the flowers, those too. Outdoor jazz, a crowd around the bike, ragged student union coffee counteracting the excesses of a fraternity lawn party. This is a vicarious glimpse of college life: I wandered over here to meet the solar car folks and ended up staying all day, addicted to beauty and music and the whole hedonistic scene. People actually live like this! There have been a number of specific treats worthy of mention since last I wrote, the kinds of things that have kept me from feeling too dangerously settled (despite being able to set the temperature of the shower without depending upon thermal feedback). 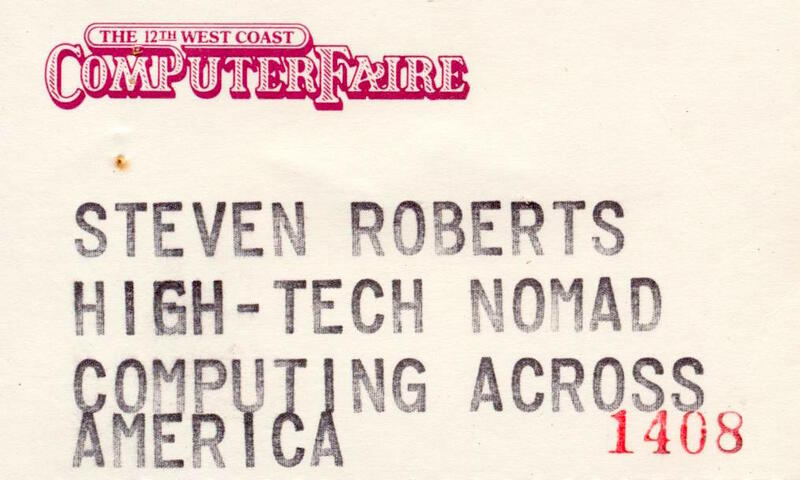 Last weekend was a good one: the West Coast Computer Faire. GEnie Information Services, my host company, really knows how to party! Rather than settle for the typical trade-show hospitality suite, the folks from Rockville chartered The City of San Francisco. The CAA team—Ray Rolls, Kelly Monroe, Michael Wanger, Maggie, and I—boarded from Pier 33, instantly coming face-to-face with familiar name tags. It’s a sensation that always intrigues me: seeing for the first time someone I already know from brain-to-brain contact. There in the eyes: the spark I recognize from a year’s accumulation of words. There in the smile: something of the warmth that came across in all those electronic emotion tokens… 🙂 and <grin> and *>–. Friday night on San Francisco Bay, there were a lot of exclamations. (“Wow! You’re Bonnie? I had no idea…”) I walked around the cruise ship, doubly wobbly from the waves and tequila mockingbirds, squinting past napkinfulls of bacon-wrapped scallops at adhesive tags bearing names I’ve known for years. Talk flowed; the night was breezy with the exchange of business cards and the energetic war stories of a new industry. Everybody seems to know, or know of, everybody else. And ah, the night. Outside our floating bubble of gently inebriated tale-swapping there drifted the city of light: a hillside glittering with the sparkles of a partying populace, headlights prowling Mt. Tam, renegade nocturnal gulls soaring ghostly against crisp sky, The Bridge overhead at once as graceful and solid as the land itself, dark Alcatraz bursting larger than life from the cold swells. A sudden sense of silence. The captain turned his spotlight on the old prison, his beam lashing hot through the night as if from watchtowers of decades past, probing the craggy rock for the desperate furtive eyes of those with nothing left to lose. Hours passed, afloat. Roundtables took on substance, the politics of the online world evident in the turnover of sysops and slow boil of schisms and alliances. I felt at once a native (with 7 years online) and a visitor (just passing through; wanna see my bike?). We are the rich protein stew of a growing network consciousness, the beginning of a whole new culture. There it sat. The doors opened, and in swarmed the computer aficionados of the Bay Area, a million of ‘em it seemed, slow-swirling like a viscous fluid through the miles of aisles, forming eddy currents and backwaters, torrents and blockages. I seemed to be responsible for one of the latter, as they passed en route from one row of screens to the next and suddenly found themselves staring at something that recalled the early days of this industry… you remember… back before power users and corporate volume buyers and IBM and hard disks and… right. That’s it. Fun! All day we watched faces set in traditional trade-show stress patterns light up with various blends of delight, ridicule, humor, relief, astonishment, and inspiration. “This is the neatest thing here!” gushed one fellow, and I handed him a flyer. All day they came, and all day I explained. Ray, Maggie, and Kelly worked just as hard, describing the handlebar keyboard over and over, pointing out the information flow and the connection to GEnie. And time and again we watched it happen: that lovely transition from “what’s this crazy thing?” to “Ohhhhh, I see!” In that sea of technology, this was the one exhibit that expressed the freedom that can be had through portable computers and network communications. GEnie loved it, of course, this unexpected addition to a booth whose theme, appropriately enough, was discovering new horizons. And I loved it as well—finding the company to be much more energetic and imaginative than the typical conservative “torporation.” I think this system will be around awhile. Being on camera, even on a bike, isn’t always easy. “OK, now ride out of frame,” crackled the voice in my ear as we started up hill. “I’m working on it,” I huffed, knowing they were looking for a smooth acceleration. An electronic sigh. “OK, OK, let’s go around and try that again.” I explained that my 1/5 horsepower body and 400-pound loaded weight are precisely equivalent to a 3-horse Briggs and Stratton lawnmower engine pushing a 3-ton mini-motorhome… and they let up a bit. We got some magnificent road shots, as well as a goosebump-raising sunset scene on a cliff over the Pacific. While the script read, “I can conjure a home anywhere at all,” I tugged on the end of my flattened porta-condo and it sprung to hangar-size, all 108 square feet of it. I hunkered down on the grass and pseudo-wrote in my pseudo-camp while the director shouted “QUIET ON THE SET!” and the producer made notes and the associate producer took production stills and the gaffer squinted at the sinking sun and the cameraman bent over the Big Eye… Through it all, Maggie looked on from the sidelines, thinking about her new unassembled DeFelice recumbent and her old Infinity lying in pieces, taking my spotlight very well—all things considered. No, silly, I’m talking to my girlfriend. Yeah, but that doesn’t automatically mean it IS true, either. One has to wonder. I met a beautiful lady this evening who made deep eye contact, explained that she is a nomad as well, and then noted that her travel style is by air. “Someone I’m meant to meet always sits next to me,” she explained. “Do you have an in with the ticket agents, or is it more cosmic than that?” I asked. Everyone seems concerned with their energy, and not in the physical sense. People SEE something, and make it clear that they don’t just mean “see.” Amateur high-ticket self-psychology is as robust an industry as ever, with organizations like Lifespring charging big bucks to teach new meanings to old words and give your life perspective. Almost everybody seems to non-electronically network, channel, or interface. An eccentric blimp fanatic calls himself the “flavior savior.” Christianity is still miraculously alive, along with countless profitable variants. And the AIDS scare remains in the news enough to obscure it’s true proportions, so mixed in with all the rest is a new and strangely perverted morality—increasingly linked, almost defensively, to spiritual matters. Most disturbing. But hey. That’s California. In this area, the multiplier of nonlinear terms is itself nonlinear; it’s a place where anything you want can not only be found, but expanded beyond all recognition. Therein lies the fun, and the energy <grin> that sparks all those new toys after which I habitually lust. Conservative attitudes do not heavy magic make. And so the layover continues, about another month. Number 27 will be slow in coming, too, so we don’t have an overload of stories from one place. And then… east? Maybe. The options are many and confusing… so let us get these machines ready for the next phase and then figure out where they’ll roll.